When it comes to choosing the best hunting knife, you must consider the manufacturer of the product. With overwhelming options in the market, it is easy to make a mistake of choosing the hunting knife for you. Hence, allow us to introduce the Smith and Wesson hunting knives. 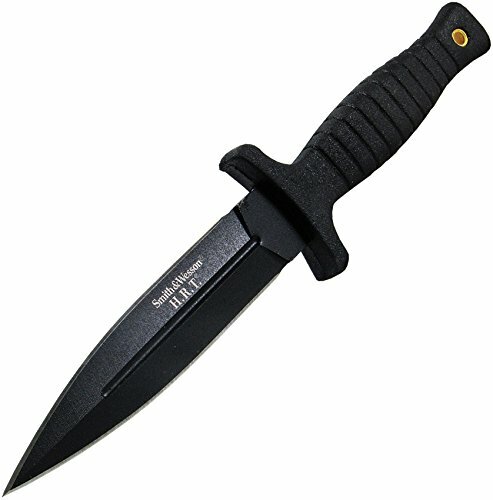 They are best known for manufacturing durable and high-performance hunting knives. Over the years, Smith and Wesson had become a trusted partner of almost every hunter—both novice and pros. For today, we are going to take a look at the top 7 best Smith and Wesson hunting knives we’ve gathered from the market. Consider each set of advantages and disadvantages, features, and functionality of the following knives that you should have for your next hunting adventure. Equip yourself with the Smith & Wesson Black Ops 3-drop Point Blade Tactical Folding Knife for your next hunting trip. This is designed to be lightweight yet strong that can do a variety of hunting works in the forest. It features a 3.4-inch black stainless steel blade that can be used for skinning, cleaning, or dressing small game. This hunting knife is supported by an aluminum handle that allows you to gain full control when using the product. There are also double thumb knots that will allow you to extend the blade as you wish. The package comes with a pocket clip, allowing you to bring the knife anywhere you want. Only weighing 4.02 oz., this knife is ideal for both novice and pro hunters. This is one of the most affordable hunting knives from Smith & Wesson. Allow us to introduce the S & W boot knife. Despite its tiny size, you can use this knife for a variety of works when it comes to hunting. The blade is made of top-grade 440C stainless steel, giving you the confidence to use this knife ruggedly at work. Its spear-shaped blade can provide a high-cutting performance. 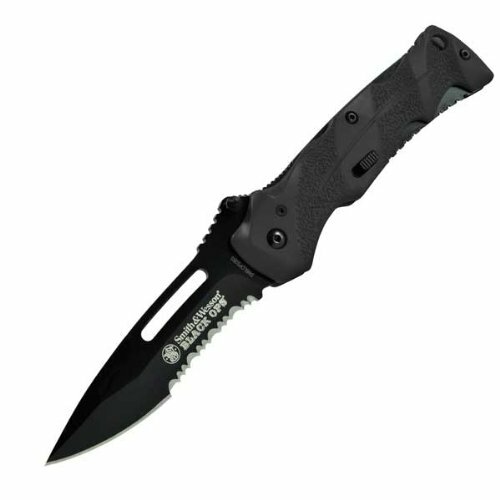 This knife also features a black rugged aluminum handle, providing reliable grip during the operation. Thanks to its lightweight design, you can tuck the knife in your boots before you embark into another adventure in the forest. The package includes a pocket clip and sheath made of nylon. The length of the blade is 4.7 inches. 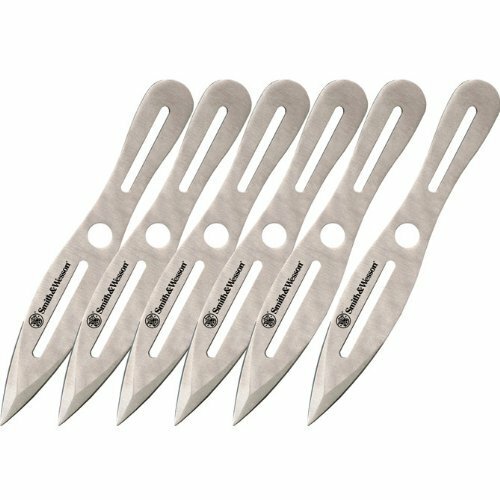 If you are looking for a hunting knife that can provide you a precision flight, you might want to check out the S & W bullseye throwing knives. This knife is designed to provide ease in putting the blade on the target. The blade is made of high carbon 2Cr13 steel, and each knife holds its edge because of its repeated target throwing. This set comes with a nylon sheath with slots that can accommodate all knives. The durable throwing knife is all you could ever need when you decide to hunt again in the woods. If you are looking for a lock back knife that can offer both durability and strength, this one is for you. Introducing the Smith and Wesson Extreme Ops Tanto Lock Back Folding Knife. This knife can be used in emergency situations. It can provide you a capable blade, a built-in glass breaker, or an integrated seat-belt cutter. The blade is made of solid 7Cr17 high carbon stainless steel. This 3.3-inch combo edge blade has a strong tanto tip that provides superior toughness. Now you have the confidence to use this knife ruggedly without any worries. Also, its non-reflective black coating can resist scratches in the long run. It has a durable stainless steel handle that features a rubber coating for a solid grip and control. The knife has a liner lock design to keep your hands safe during operation. Only weighing 4.4 oz., you can quickly place this knife at your back pocket the next time you’re going to hit the forest. Next, we also have the Smith & Wesson Frame Lock Drop Point Folding knife that can help in making your tasks more manageable. It features a rugged folding knife that packs a lot of punch in the razor 2.28-inch high-carbon stainless steel drop-point blade. This knife features a designed stainless steel handle to secure a solid grip during the operation. It has a frame lock and spine jimping that works together in delivering a smooth cutting process. Aside from that, the ambidextrous thumb knobs will allow you to operate the knife single-handedly. Once folded, the knife only measures three inches, allowing you to bring the knife in your backpack or pocket. 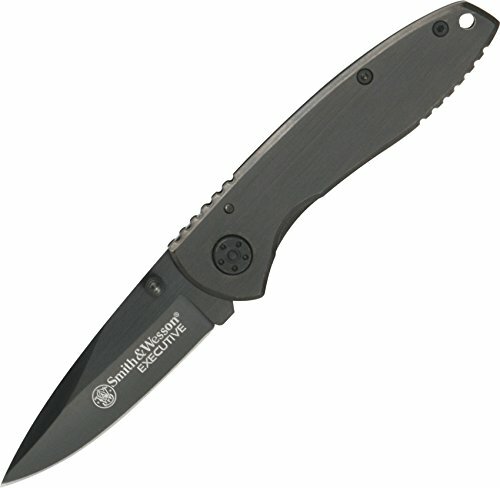 For the last product, we have the Smith and Wesson Search & Rescue knife. This is a fixed-blade knife with long, powder-coated, high-carbon stainless steel blade that can do a variety of works. 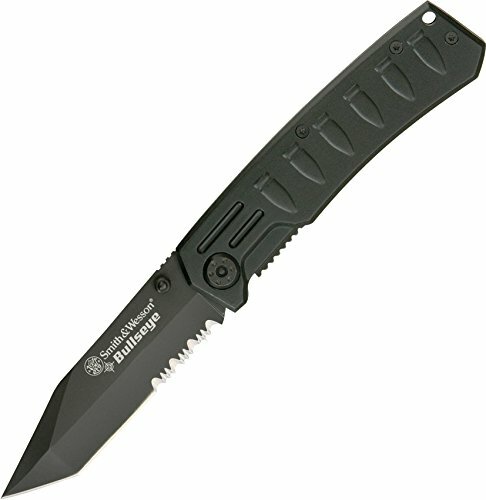 Since it’s not a folding knife, it is superior in durability and can provide more stable support. It also has a rubber handle to ensure that the knife will never slip while you are using it. The package includes a sheath and a sharpening stone, so you won’t ever have to deal with dull edges again. The length of the blade is only six inches while the overall length of the product is 10.5 inches.